Our top-10 blog posts from 2016! As we turn the calendar from 2016 to 2017, it’s a great time to reflect on what an eventful, sometimes challenging, but fulfilling and blessed 365 days it’s been. So we’ve decided to commemorate 2016 and the transition to 2017 by bringing you our top-10 blog posts of 2016, as determined by the number of reader views. I really appreciate all of my patients and only hope that I can continue to improve your lives in 2017. Please don’t hesitate to contact me if you have any pain, health issues, or just want to talk. Here’s wishing you a healthy, happy, and prosperous 2017! 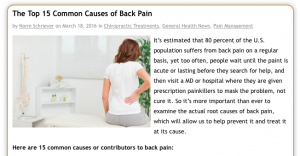 The Top 15 Common Causes of Back Pain. 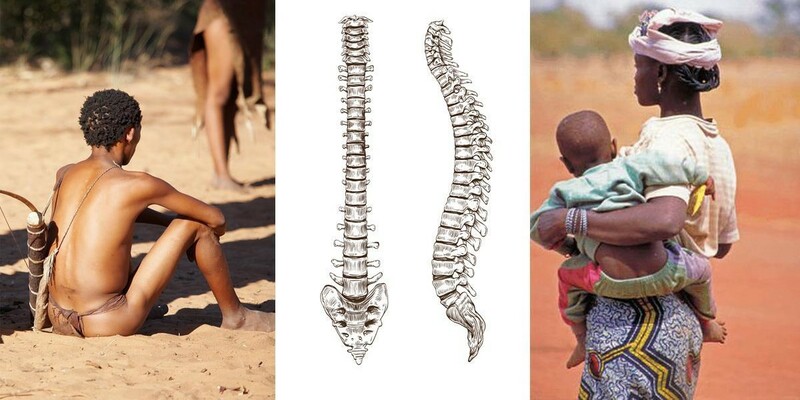 20 Incredible facts about the human spine! 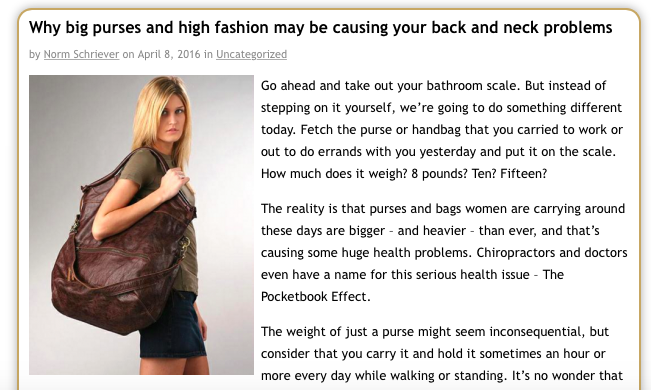 Why big purses and high fashion may be causing your back and neck problems. 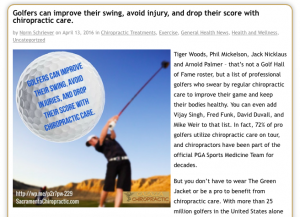 Golfers can improve their swing, avoid injuries, and drop their score with chiropractic care. 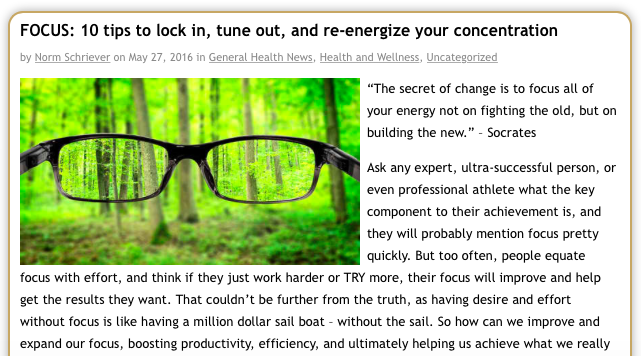 FOCUS: 20 tips to lock in, tune out, and re-energize your concentration. 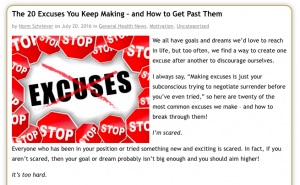 The 20 Excuses You Keep Making – And How to Get Past Them! Athletes, sports and chiropractic care! The 15 Health Benefits of Drinking Tea. 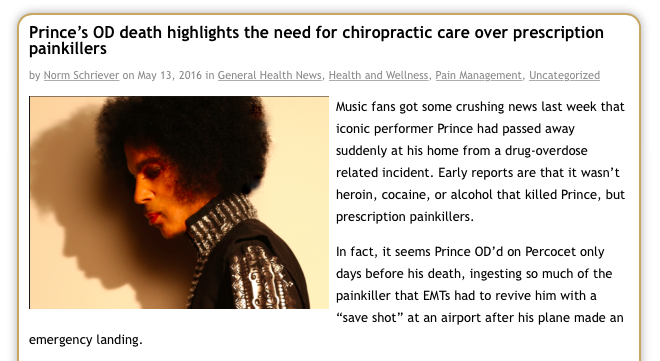 Prince’s OD death highlights the need for chiropractic care over prescription painkillers. 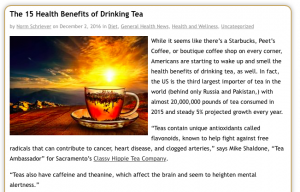 While it seems like there’s a Starbucks, Peet’s Coffee, or boutique coffee shop on every corner, Americans are starting to wake up and smell the health benefits of drinking tea, as well. 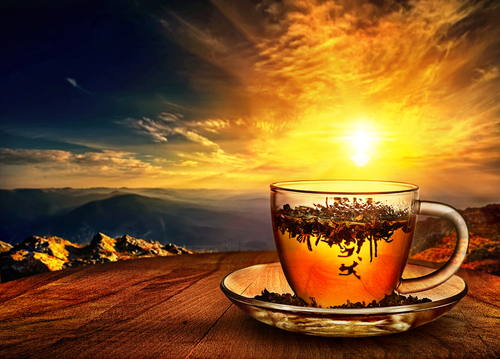 In fact, the US is the third largest importer of tea in the world (behind only Russia and Pakistan,) with almost 20,000,000 pounds of tea consumed in 2015 and steady 5% projected growth every year. 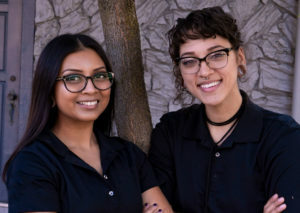 “Teas contain unique antioxidants called flavonoids, known to help fight against free radicals that can contribute to cancer, heart disease, and clogged arteries,” says Mike Shaldone, “Tea Ambassador” for Sacramento’s Classy Hippie Tea Company. But drinking tea for its health benefits (as well as the fact that it tastes great) is nothing new, as different cultures around the world – especially in the Far East – have consumed tea for thousands of years to promote health, happiness, and wellness. Tea contains high levels of antioxidants, which help the body fight off toxins and keep us healthy and young. In particular, tea contains high levels of polyphenols (a type of antioxidant) and phytochemicals that aid our systems. Regular tea drinking also boosts your immune system, helping immune cells reach their target and function faster. Tea does contain caffeine, but in fact has about 50% less caffeine than our favorite coffee drinks, giving you a boost without disturbing your nervous system or sleep patter. 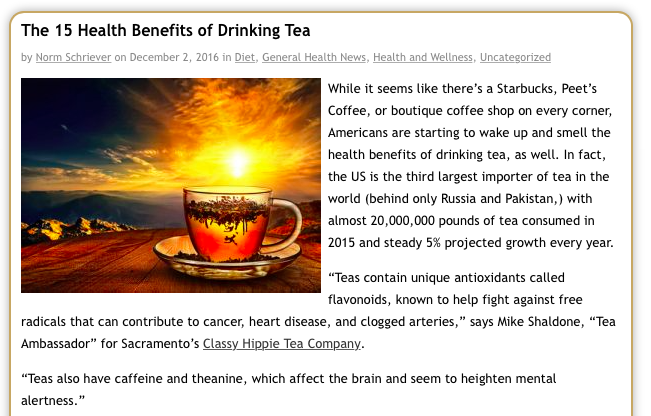 The important thing to know is that tea contains caffeine and theanine, which affects the brain by naturally heightening mental alertness. Research points to the benefit of tea in reducing the instances of heart attacks and strokes. Recent studies show that people who drank one to three cups of green tea every day showed a 20% reduction heart attacks and a 35% reduction in the instance of strokes. Once people drank four cups of tea or more, they were 32% less likely to suffer a heart attack! There is evidence that regular tea consumption may help with weight loss, though more research is needed to see if this is just a correlation or a direct cause. But one study showed that tea drinkers had lower waist circumferences and lower BMI’s than non-tea drinkers. By the way, did we mention that tea is calorie free? Even if tea drinking signals a healthier lifestyle – but doesn’t actually reduce weight – switching out higher-calorie coffee drinks (once you add milk, flavorings and all the sugar) can knock off hundreds of calories every day. According to data from recent animal studies, green tea helps prevent bone loss and osteoporosis. Drinking tea actually helps tooth decay and cavities, Japanese researchers found, by lowering the pH levels in your mouth and protecting tooth enamel. Tea may also help to fight cancer, although more medical research needs to be done. But what is factual is that the antioxidants in tea help combat various forms of cancer, including breast, colon, colorectal, skin, lung, esophagus, stomach, small intestine, pancreas, liver, ovarian, prostate and oral cancers. Drinking herbal teas, and especially chamomile, helps soothe the digestive system because it is an antispasmodic, and ginger tea can ease nausea. Green tea can actually increase your endurance when you’re exercising, since the catechins (antioxidants) in green tea boost the body’s ability to burn fat as fuel, aiding muscle endurance. Tea also helps fight free radicals that damage our DNA and have been linked to cancer, heart disease and neurological degeneration, since it’s high in oxygen radical absorbance capacity. Unlike coffee and other drinks that leave your body dehydrated, tea is actually just as hydrating as drinking water – but with the extra bonus of a little natural caffeine. Studies have shown that there’s a link between drinking tea and a lower risk of Parkinson’s disease, even when they accounted for other health and lifestyle factors like diet, smoking, physical activity, age and body mass index. Green tea might actually provide some protection from the harmful ultraviolet rays of the sun, acting as a natural low-level sunscreen (but still but on sun block!). If you smoke (and don’t plan on quitting anytime soon,) make sure you drink a lot of tea since it’s been found to counteract some of the negative effects of smoke, including reducing the risk of lung cancer. Research shows that some of the compounds in green tea help diabetics process sugars better, offering a great benefit to people with Type 2 diabetes. What kinds of teas should you drink? Which teas will help specific health issues? And are there are some things to watch out for when choosing and drinking the right tea? We’ll go into depth to answer all of these questions and more in part two of this blog! 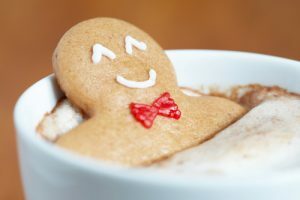 The 10 biggest changes people experience during the holidays. The holiday season is here, and that means a lot of fun with friends and family, but also some big changes to your mental and physical health, schedule and even bank account. In fact, most people will experience some (or all!) 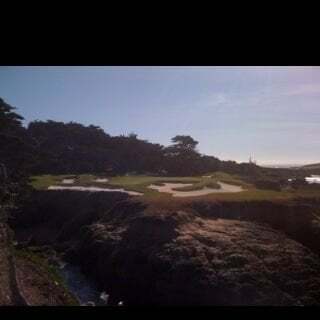 of these changes during the period from Thanksgiving week until the confetti is cleaned up on New Year’s Day, and the holidays season in between. Almost 4 out of 10 people experience some sort of increase in stress during the holidays, while 5.5 out of 10 maintain the same stress level and less than 1 out of 10 say their stress levels decrease during holiday time. But stress levels are higher than this for working adults, and nearly 5 out of 10 of all women also feel more stress during the holidays. The holidays bring out a range of emotions in people, both good and bad, creating a confusing and often contradictory emotional period. For many people, the holidays are all about spending time with family, friends and loved ones. When asked what their favorite thing was about the holidays, 53% of people mention family and/or friends and 36 percent specifically mention spending more time with family. Interestingly, 35% of women spend time with their parents during the holidays, but only 15% of men do the same. We make great efforts to spend time with family during the holidays. In fact, visits to see friends and family account for about 24% of long-distance trips throughout the year for Americans, but that number jumps to 43% for Christmas and 53% during Thanksgiving. This Thanksgiving, 43.4 million people are expected to travel. The average person travels 275 miles for Christmas. The average holiday vacationer will travel 601 miles and spent $465 just on transportation. Travel to a destination 50 miles or more away increases by 54% over Thanksgiving weekend but only by 23% during Christmas and New Years. A whopping 71% of those surveyed report having extra time commitments and things to do during the holiday season. We may get time off for work (an average of just 7.6 paid vacation days annually for U.S. workers), but between parties, family obligations, religious observances, travel and shopping, we have less time than ever. In fact, the average shopper plans to spend $805 on gifts during the holiday season. Around the world, we spend $2.6 billion on wrapping paper alone! Black Friday is estimated to generate about $64 billion in sales just that one day! 46% of holiday shopping is done online these days, and growing every year. We may feel like we’re saving money by staying home but online shoppers actually spend 22% more than those who physically visit stores. Visa reports 5,340 card swipes per minute between Thanksgiving and Christmas! The average modest holiday meal contains 1,297 calories – without seconds, dessert, or larger helpings. That means it would take 150 minutes of high-intensity exercise just to burn off one holiday meal! Don’t forget about our super-charged sugar intake during the holidays, and increase in alcohol consumption as well. Most of us moan, lament and disparage at the weight we’re putting on during the holidays. But is it really that bad? In fact, our perception is far worse than the reality, as most people estimate they’ve gained 5-10 pounds during the holiday season. But the average weight gain is only 1-2 pounds. The problem is that we’re not doing a good job taking that 1-2 pounds off, and often stressing about it more than doing something to lose the weight and improve our health! In fact, roughly 75% of annual weight gain takes place during the holiday season. We tend to work out less during the holiday season, or even abandon our exercise regimes all together. Gyms and health clubs are often comically empty during the period from Thanksgiving week until New Years! Likewise, though it would make perfect sense that we work out more at home – even taking brisk walks after meal time, doing some yoga or calisthenics, or just staying more active – we tend to exercise a lot less in the midst of all of those indulgent meals and sweets. 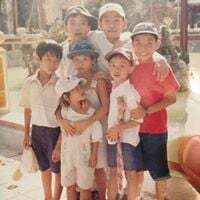 But the holidays also lead to hope for better things in the coming New Year, most often manifested through our New Year’s resolutions and goal setting. Contact me if you’d like to learn how chiropractic can help you stay fit, healthy, happy, and feeling great during the holidays! 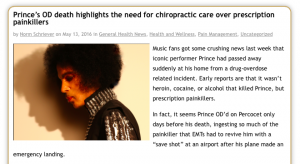 Chiropractic cures the common cold? 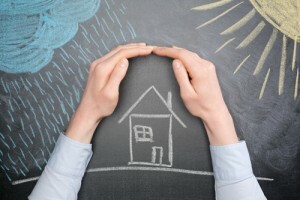 How to remain healthy during cold and flu season with chiropractic adjustments. Sniffling, sneezing, feverish, and hurting all over? Yup, welcome to flu season again, that lovely period every winter when the cold, rainy weather seems to bring out the worst in our health. Whether it’s just feeling like you’re fighting something off, a nagging cold, or the full on flu has you bedridden, it’s no fun to get sick. In fact, each year, between 5 and twenty percent of Americans come down with a case of the flu, which adds up to 15 to 60 million people, directly or indirectly causing thousands of deaths. If you’re like most people, you get sick as a dog at least once during the cold weather months, and sometimes feel like you’re not fully well most of the season! 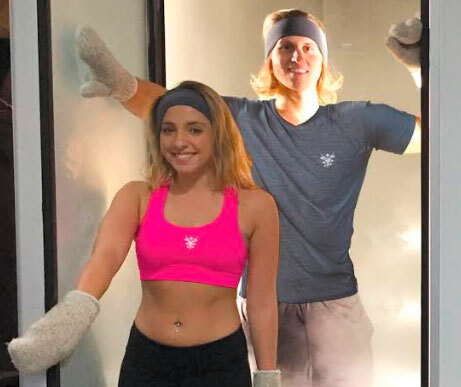 So imagine how amazing it would be if you stayed perfectly healthy this winter? Chiropractic care is your best chance of making that happen, along with other preventive health and lifestyle measures we’ll cover here. But what does chiropractic have to do with fighting off colds and the flu? 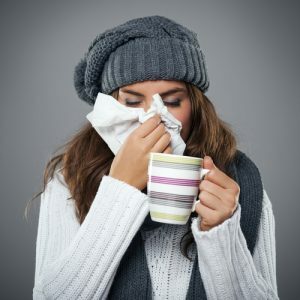 Remember that the body’s immune system has the critical function of fighting off foreign invaders – in this case, bacteria and viruses that cause colds and the flu. Once your immune system is overcome by these attackers, you fall sick. And when your immune system is weakened, it’s far less likely to be able to fight something off, resulting in your getting really sick. So boosting your immune system and keeping it running optimally is key to staying healthy. It’s also important to note the direct relationship between the immune system and the Central Nervous System (the brain and spinal cord). If your Central Nervous System is compromised or not working right, it can affect the strength and function of your immune system. Basically, as the master control system for your body, if the Central Nervous System is under stress (called Subluxations), nothing else will work right – including your immune system. 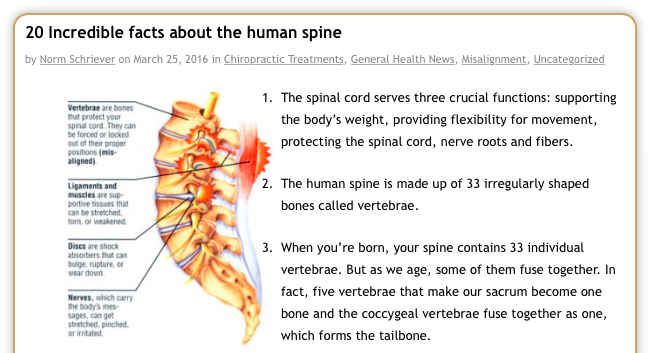 However, chiropractic adjustments remove subluxations, allowing for proper communication in the nervous system. By improving your brain and body connection you’re allowing your system to work optimally, helping every other system in your body work properly, including your immune function. Just how effective can chiropractic adjustments be for helping you fight off the common cold or a more harmful flu? In a recent study published in Chiropractic and Manual Therapies, researchers found a direct and effective impact from just one single chiropractic adjustment. This aided their immune system, among many other systems in the body. White blood cell count to increase, the specialized cells responsible for fighting off viruses. Sinus passages to clear naturally, which are breeding grounds for bacteria and one of the causes of infection. 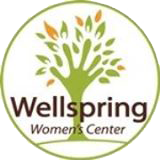 A clear decrease in most symptoms of a cold and flu. Reduced sinus pressure, headaches, nasal drainage or runny nose, sore throat, body muscle aches, and even overall fatigue or malaise. In fact, patients who regularly get chiropractic adjustments become ill less often, experience far less symptoms, and recover quicker. So how do you give yourself the best chance to stay cold and flu free this winter? Wash your hands often with soap and water or an alcohol-based hand rub, especially after being in public. Avoid touching your eyes, nose, or mouth as much as possible. Viruses can live on surfaces for up to 24 hours and most people touch something that a sick person did and then touch their eyes or face. Try to avoid close contact with people who are sick with the flu. Boost your immune system by eating plenty of Vitamin C-rich foods like oranges and grapefruit (in season during the winter) as well as dark green leafy vegetables like spinach and kale. Sesame seeds, red bell peppers, and a whole host of other nutritious vegetables and foods can help keep you healthy. Take Vitamin D3 and Vitamin K supplements. During the warm weather months, we’re far more likely to be outdoors, giving our bodies plenty of essential Vitamin D3 naturally. So taking Vitamin D3 (along with Vitamin K to aid its effectiveness) will increase your immune system function, helping you fight off viruses and bacteria. 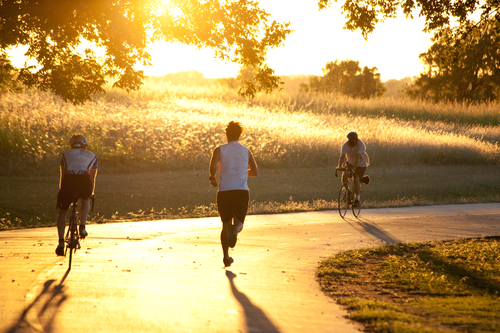 Getting plenty of exercise and staying active will help boost your immune system and keep you healthy. Cut back on coffee and drink green tea instead. You’ll also want to take some probiotics, like yogurt, with natural bacteria that will help fight attacks on your immune system. 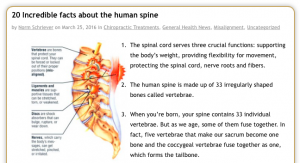 Come visit Dr. Casazza at Active Life Team Chiropractic and get adjusted! What should you do if you’re already sick with a cold or the flu? Studies show that getting at least 8 hours sleep reduces the likelihood of getting sick. Zinc helps your body fight off infection, reducing the duration of a common cold. Staying very well hydrated and flushing toxins helps you recover faster. Once again, come visit Dr. Casazza and get adjusted – it could keep you from getting sick with colds and the flu this winter! 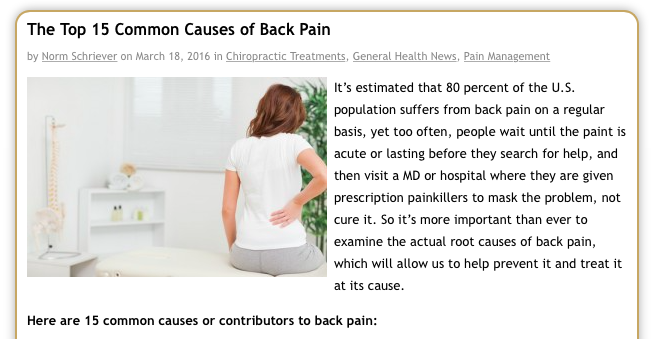 Back pain is one of the most common reasons for people to visit a MD, hospital or start taking prescription painkillers, and that’s especially true for athletes who suffer sports-related injuries and discomfort. In fact, 75% of all elite athletes experience back pain at some point during their playing days, and even 10-15% of child and teen athletes experience low back pain. 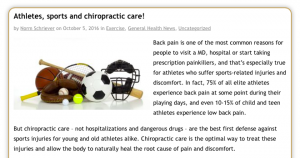 But chiropractic care – not hospitalizations and dangerous drugs – are the best first defense against sports injuries for young and old athletes alike. Chiropractic care is the optimal way to treat these injuries and allow the body to naturally heal the root cause of pain and discomfort. 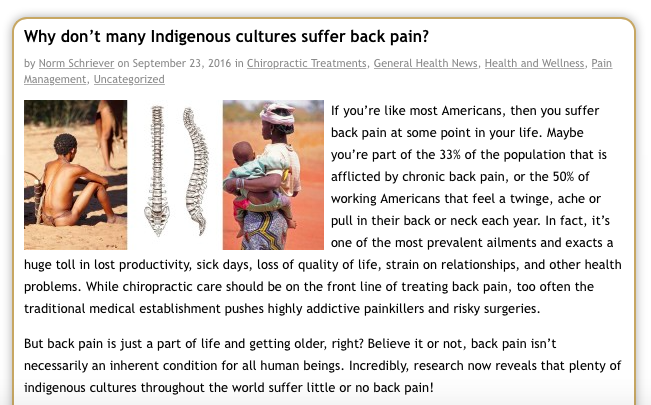 But you don’t have to be an elite athlete to suffer back pain or sports injuries. In fact, there are about 30 million children in the U.S. people who play organized sports – and that doesn’t count all of the kids that play pickup or recreational sports. 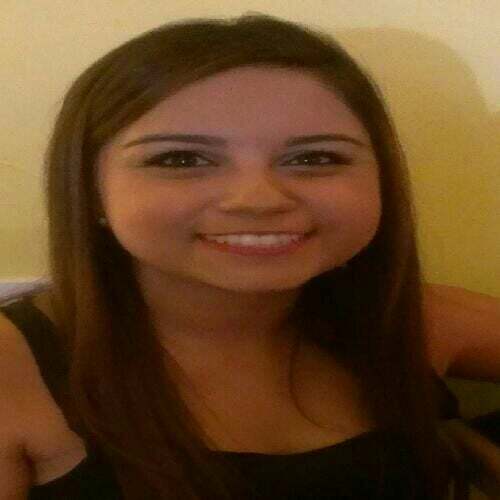 Each year, high school athletes alone suffer 2 million injuries resulting in 30,000 hospitalizations. 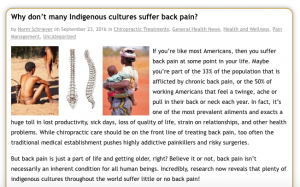 So which sports are the hardest on the body and cause the most lower back pain? Some of the findings are fairly predictable, but some may surprise you. Intercollegiate athletes see their share of lower back injuries, considering that an alarming 7-13% of all injuries in college sports are lower back injuries. Of those back injuries, 60% are simple muscle strains while 7% are disc injuries. Other common sports injuries include neck pain, whiplash, concussions, sport hernias, MCL sprains, quadriceps sprains, hamstring sprains, ankle sprains, shin splints, and Achilles tendonitis. It’s no wonder why 39% of college athletes receive chiropractic treatment and most major college athletic departments now have a chiropractor on staff. In part thanks to those chiropractic treatments, research also shows that athletes don’t tend to have lingering lower back issues at the rate of the general population, most likely because their fitness level, activity, and other health factors make them quick healers with lower back pain actually less common for former athletes than non-athletes. 75% of non-athletes experience some lower back pain, compared to only 31% for athletes. However, disc degeneration is far more common for elite athletes than non-athletes because of the massive strain and stress they place on their body. But injuries and lower back pain are just one of the ways chiropractic care can aid the modern athlete. In fact, 90% of all world-class athletes also now use regular chiropractic care to amplify their performance, avoid injuries, and recover faster. Research shows that athletes see a 6.12% increase in their athletic performance after receiving spinal adjustments from a chiropractor. In fact, after only12 weeks of chiropractic treatments, athletes measure 30% higher in their hand-eye coordination. 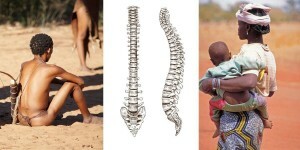 Chiropractic care certainly doesn’t stop when young and teen athletes progress. 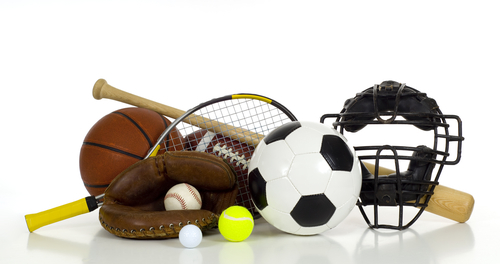 In fact, elite athletes in every sport use chiropractic care. 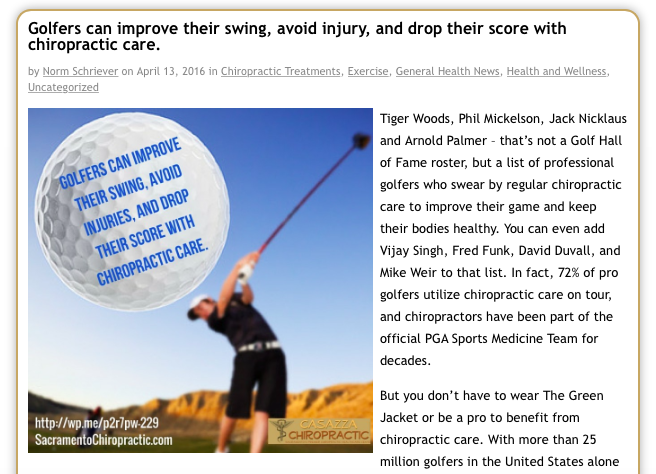 72% of PGA golfers on tour receive chiropractic care. A near-perfect batting average .930 of Major League Baseball teams have a chiropractor on staff, and the same goes for the majority of pro basketball and hockey teams. 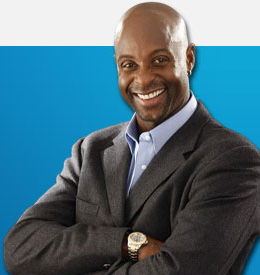 Every single NFL franchise employs a team chiropractor now, up from 31% in 2002. In fact, during a typical NFL football season, chiropractors give 16,320-27,200 individual treatments to these pro players! The reality is that every athlete in every sport or physical endeavor will see tangible benefits from regular chiropractic care. For instance, chiropractic treatments can help basketball players improve their speed, flexibility, balance, and strength. Baseball players jump higher, increase coordinate and strength when they get regularly visit a chiropractor. U.S. judo athletes experienced a 16% stronger grip after just three chiropractic sessions. Chiropractic also allows the body to heal naturally, boosting the immune system and speeding recovery from injuries. 80% of hockey-related injuries, which often include painful shoulder problems, can be managed with four treatments or less. Chiropractic care can ease discomfort in 50% of tennis players that suffer from tennis elbow. Soccer players with groin strains or pulls see relief in only 8 weeks or less with chiropractic care. 100% of runners with join problems said that chiropractic care reduced their pain and symptoms, allowing them to maintain or increase their mileage and keep training. Even Olympians love chiropractic care, as the U.S. team in Rio De Janeiro this summer brought plenty of chiropractors along, boosting their performance and helping them manage injuries on the way to a record Gold Medal winning performance. 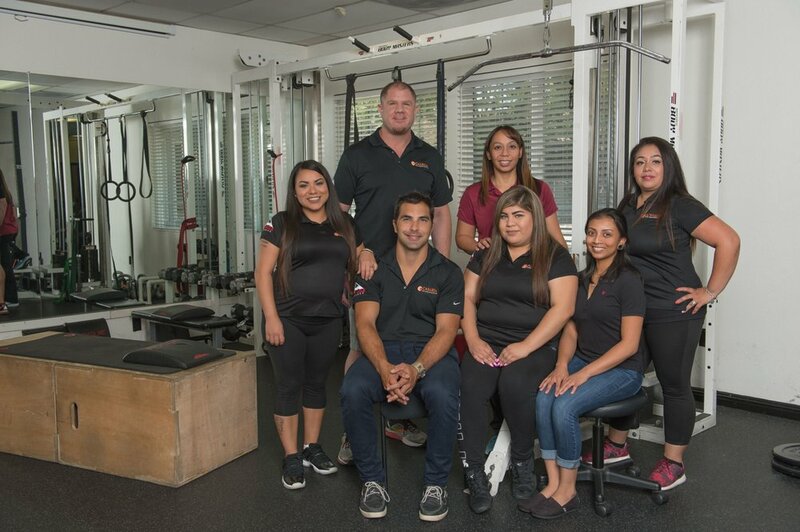 In fact, chiropractors have been a mainstay at the Olympic Training Center in Colorado Springs, where U.S. exercise physiologist Sean Atkins estimates that at least 90% of top athletes utilize chiropractic on a regular basis. If you have a child playing organized sports, a high schooler excelling at competitive sports, or even if you’re the proud parent of a college athlete, the best advantage you could give them is access to regular chiropractic treatments and care. 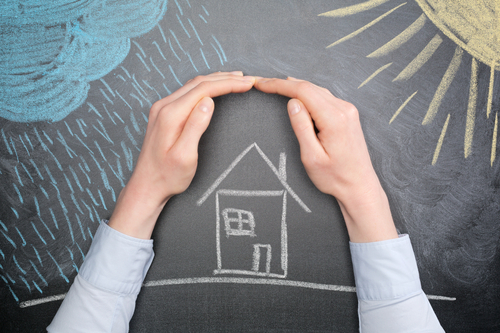 Feel free to contact us for a simple evaluation! September is National Self Improvement Month, a time to reflect upon your life, set new goals and take strides to make personal changes in order to achieve the life you truly wish. Observed every ninth month of the year, it gives us the chance to not only support and encourage your personal growth, but also illuminate the self-improvement movement. Today, we’re going to look at the immense business that serves the public’s thirst for self-help. 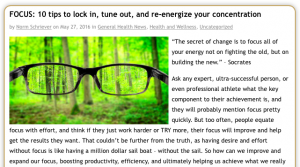 In total, the self-improvement industry is worth $11 billion just in the U.S. every year. The industry is still on the rise with 5.5% growth annually, and a projected 6.1% annual growth rate in the future per Marketdata Enterprises. There is no denying that self improvement has become big business, with tens of millions of people around the world look to make positive changes in their lives ever year with the help of self help products, materials, and services. Live training seminars that look to motivate, empower, and teach people to reach their potential are now a $500 million industry. But these days, the fastest growing segment of the self-improvement seminar industry is virtual seminars, events, and coaching. Webinars, teleseminars, and other virtual communications methods have in part replaced expensive and time-consuming travel. There are approximately 18,000 life coaches working in the U.S. alone now with exponential yearly growth, although the industry is still largely unregulated. Self help and personal growth books have been huge sellers for decades now, with an estimated $776 million in sales for 24 million Americans every year. In fact, there are almost 15 million books about dating and relationships sold every year! Who uses self-improvement most commonly? The typical self-improvement disciple who might buy books, attend seminars, and utilize coaching is a woman who is middle-class and well educated. But a highly sought demographic is also corporations, as speeches, training and seminars for businesses bring in big bucks. Other than relationships, the most common goals that people want to achieve through self-help books include increasing happiness, weight loss, success, money, and spirituality. In fact, many self-help gurus and popular systems know this, and release a series of books, seminars or products that touch on all of these themes. They realize that people who look for self-improvement materials have a high “Recidivism rate,” most likely buying at least one before in the last 18 months. In 1936, self help icon Dale Carnegie released one of the most famous books of all time, “How to Win Friends and Influence People,” and then later, “How to Stop Worrying and Start Living,” both of which are some of the most popular books ever on Amazon.com. But the undisputed modern self-help guru is Tony Robbins, who brings in more than $80 million a year from his books, seminars, appearances, endorsements, videos, and coaching, making him the most profitable self improvement brand of all time. The 56-year old Robbins is now worth an estimated $480 million. But the award for the best selling self improvement book of all time goes to “Men Are From Mars, Women are from Venus” by John Gray, selling 50 million copies and spending an incredible 121 weeks on the New York Times best seller list.